The LED series has been upgraded to a different design a little larger frame, powder coated an ready for shipping. They are coming off production an there is a 2 days lead time. We have mainly sold this Deluxe LED fan through our web site. We have sold over 4000's this year of the Deluxe Fans, we are making it available now through eBay and Amazon. 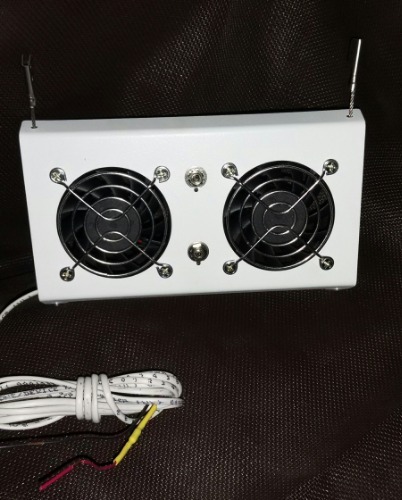 For every cooling unit sold through our web site, the customer is adding a evaporator circulation fan to their order. This unit does not have to be wired to the interior light, but can if your refrigerator has DC power to light at all times. Why take a chance mis-wiring to damage PC Board controlled light DC power slide the fan wire through the drain tube to make a DC connection on the back side. This simple add-on make your refrigerator work like a frost free refrigerator plus allowing the inside to be colder quick top to bottom. A great add-on fan for the Marine or Truck refrigerators to cool like the RV'ers.